ROC's reports, white papers, policy briefs, and fact sheets highlight the pathways toward creating a healthier, equitable and more resilient food system. Roots of Change understands that advocacy requires insightful and accurate data to support its policy recommendations for food and farming reform. In addition to undertaking original research, we collaborate with academia and other think tanks to fill in information gaps that create barriers for the good food movement. Our reports, white papers, policy briefs, and fact sheets highlight the pathways for policy makers and the public who are interested in creating a healthier, equitable and more resilient food system. 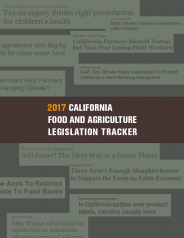 This is the fifth annual Tracker that analyzes the performance of state legislators and the governor related to the policy priorities of the food movement. 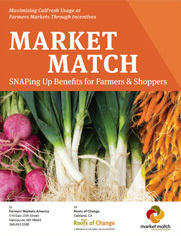 This document reflects the consensus opinion of the thirty nine nonprofits and county-based advocacy groups focused on transforming the food and agriculture that endorsed the document. This is the second annual scorecard revealing the support of each state legislator to the priorities of California’s movement for a healthy, just and ecological food and agriculture system. This scorecard is the first of what we intend to be an annual publication. We believe Californians must know how their elected representatives respond to bills meant to enhance California’s food and agriculture, critical determinants of public health, economic opportunity and resource protection. The Policy Work Group, comprised of nonprofits and food policy councils, believes that sound food and agriculture policies are key to creating more healthy food access and resilient and profitable farms and ranches. 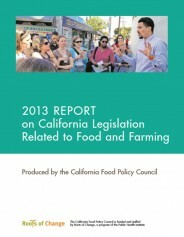 This is the 4th annual report analyzing the performance of state legislators and governor related to the policy priorities of the food movement. 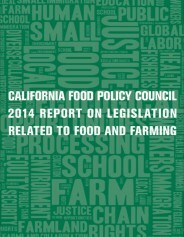 The California Food Policy Council (CAFPC) believes that sound food and farm policies are key to promoting vital communities and a healthy future. This 2015 report is our third consecutive effort to track and analyze bills critical to food production and food access in the state legislature. 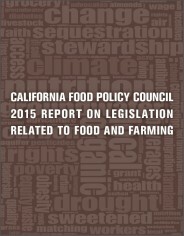 The California Food Policy Council (CAFPC) believes that sound food and farm policies are key to promoting vital communities and a healthy future. 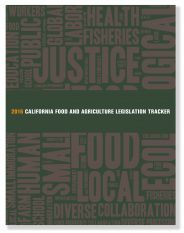 This 2014 report is our second consecutive effort to track and analyze bills critical to food production and food access in the state legislature. 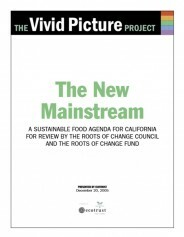 ROOTS OF CHANGE (ROC) conceived the California Market Match Consortium (CMMC) to exemplify a central tenet of its theory of change: Actions to improve the food system should seek to solve multiple problems to create transformative synergy. As the CAFPC, we provide broadly supported guidance and assistance to decision makers as they develop new policies, regulations, programs, funding, technical support and research priorities affecting food and agriculture in our state. 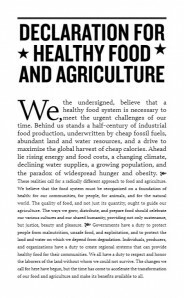 We, the undersigned, believe that a healthy food system is necessary to meet the urgent challenges of our time. Behind us stands a half-century of industrial food production, underwritten by cheap fossil fuels, abundant land and water resources, and a drive to maximize the global harvest of cheap calories. Ahead lie rising energy and food costs, a changing climate, declining water supplies, a growing population, and the paradox of widespread hunger and obesity. The Vivid Picture project team has been actively working since March of 2004. We began by interviewing you, the Roots of Change Council, and dozens of other food and agriculture leaders. We heard that it was time for the sustainability community to pull together a cohesive vision for a sustainable food system.